Just in time for the winter . Chef Dominique Ansel announced today that customers now have the option of pre-ordering cronuts instead of waiting in line outside the bakery for his much-celebrated croissant-donut hybrid. Pre-orders begin every Monday at 11 a.m. ET and are for pickups two weeks from the order date. Orders can be placed by calling (212) 219-2773 or paying online. Each Cronut is $5 and customers can pre-order up to six. 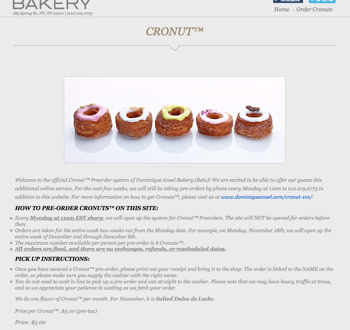 Excited to offer Cronut™ preorders by phone and now ONLINE at http://t.co/1xQm417Yx2. (Both work!). It's in beta, so bear with us.